Has your garage door opener stopped working properly? 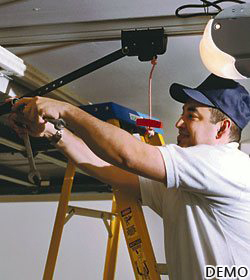 Are you in need of a garage door opener repair service, but unsure who to pick? Here at Garage Door Ottawa we pride ourselves with our preceding reputation and long-lasting commitment. We take our garage doors pretty seriously, because we understand how frustrating they could be. Huffing and puffing early in the morning right before your work is not the way we want you to begin your day. Allow us to recommend top-quality service and necessary tips to maintain the working condition of your garage door year-long. Your garage doors and openers must be maintained annually to avoid any unsafe circumstance or unnecessary troubles. Understanding what the job entails and how fastidious, demanding, and dangerous repairing a garage door can be, have one of our experts examine your garage door with the proper equipment for an injury-free zone. Our team of experts will be able to pinpoint exactly what the main problem is and where there could be potential for future malfunctions with particular components. Your personal safety should not be undermined. Taking preventative measures by calling one of professionals will not only be a cautious choice for your personal well-being, but also cost effective in the long run. This process is often overlooked by homeowners, so we want you to call our trained service technicians to help you prevent damages and resolve your problems. Our company trained technicians arrive ready to handle and repair all your garage door opener inquisitions and problems. Highly dependable, reliable and qualified with over 20 years of experience, our team of technicians can ensure your garage door opener repair service is done with the highest standards. With proper examination and full-on inspection, we give you appropriate recommendations for repairing and maintaining your garage door, at valuable quality and cost-conscious options. Available seven days a week at (613) 845-9950, we are here for you and your garage door opener with impeccable repair services.